What a difference twenty five years makes. The original Mummy movie in 1932 was wonderful in many ways, though made during those years filmmakers struggled to learn the new medium. The whole thing was shot as though it was on a stage and the actress (and there is ever only one) spent most of her time reclining. Still, it’s a great movie that stands the test of time. Seems like it’s been downhill since. 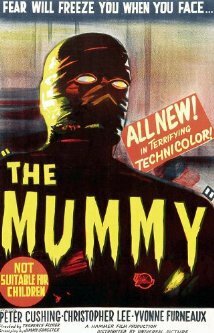 I’ve been catching up on Mummy movies, after someone asked me for an opinion on the differences between zombies and mummies and I realized I’d only ever seen two Mummy movies. This Hammer Studio version of the angsty blasphemer’s revenge is bright and clean and wooden. Those Egyptians sure knew their stuff, building a crypt with doors that open smoothly on four thousand year old hinges, with oil lamps that are STILL providing good spot lighting inside the voluminous tomb. White men don’t work, they just watch shirtless locals sift through a wheelbarrow of sand, while others search for archaeological treasure in the middle of rocks. Seriously, they were sledging rocks. There is no sense of foreboding because who gives a hang about some stiff-lipped lords who dabble in the “science” of archaeology as a means of decorating their foyer. They’re the only ones in actual danger, and the extraneous body count is purely coincidental. The woman barely registers as being in the movie at all, and so does the menace to her. Well, she did ruin a lovely dress. Having to emote through partly mummy-wrapped eyes, Christopher Lee tries hard to bring some feeling to his two roles as the standard blasphemer-turned-mummy, but he sure doesn’t give the audience anything when he walks calmly to his standing grave. Karloff in the original made you really feel the terror of knowing you’re going to be hogtied and buried alive. Peter Cushing plays the puffed-up Lord of the Dig who shows more interest in his elegant billows of cigarette smoke than being afraid of the monster he knows is coming for him. I was surprised how little I cared for the film, considering the reviews that claimed it was one of the good versions. Still, I intend to continue my education so I can continue the discussion on the differences between the two monsters. There are fewer than you might think at first, and one of the similarities is a preponderance of truly horrible films with a few sparkling gems sprinkled about. If you love Hammer films and young icons Peter Cushing and Christopher Lee, you may be able to get beyond the film’s limitations, but I have to say I don’t recommend the movie unless you’re looking for something lame.